Arizona hot dog cart rental. Hot dog cart rentals in Arizona. We only rent carts to other caterers, restaurants, hotels and food service professionals. This is because you need the licenses, the permits, the insurance, the commissary capability and the training to safely prepare food on propane fired carts. If you are looking to get into the business, with regrets, this is not how you do it. The only way you get to "try out" this business is you work for a hot dogger. Be ready to volunteer some days to do this. That's exactly what we recommend you do if you want to get into this business. If you figure out how to make life easy on us, we might keep you around. If you are around us you are learning this business. None of us can keep from talking for long, it's not in our nature. For full hot dog catering service with our outstanding menu, please see our home page. 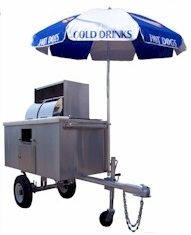 That said, if you need a cart, contact us and reserve your hot dog cart rental today! © 2007-2019 AZHotdog Of Arizona, All Rights Reserved. Contact AZHotdog, Phoenix Arizona's hot dog vendor of distinction. Cart design.